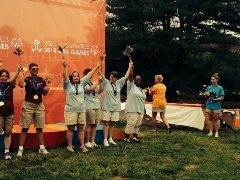 Greater Atlanta Pathways had four members competing this summer at the National Special Olympics competition in New Jersey: Lianne Avant (representing Tennessee) won gold in bowling; Diane Hill won silver in doubles bocce; June Morsberger won gold in singles bocce; and Jamie Gillispie won bronze in unified tennis! Congratulations to our winners!! !